When I first got my KitchenAid mixer I promptly ignored the recipes included in the instruction book thinking they were too plain. Vanilla? Strawberry? Chocolate? Psah, for amateurs. *if you compare my adaptation with the link you’ll find I omitted the lemon zest and juice, I’m sure it’s good but I didn’t have a lemon. I also used 1 cup of heavy cream and 3/4 cup half & half, again a refrigerator stock issue, however the ice cream was certainly creamy enough and I don’t think I would change this next time. Combine cream and salt in a saucepan and bring just to a boil (to be honest, mine boiled over but no harm seemed to be done). Remove from heat (and clean your burner). Whisk eggs with 1/2 cup sugar in a bowl. Add the hot cream in slow steady stream whisking vigorously to prevent the eggs from cooking. Pour back into saucepan and return to the burner. Cook over moderately low heat, stirring constantly until thickened and a thermometer readers 170 F.
Stir puree into custard and chill in the back (coldest part) of the refrigerator for a couple of hours before pouring into your KitchenAid mixer OR follow your ice cream maker manufacturer’s instructions. If you don’t have an ice cream mixer I think it is still possible to make this (and other ice creams.) I would simply place ice cream in freezer and take out and stir often. 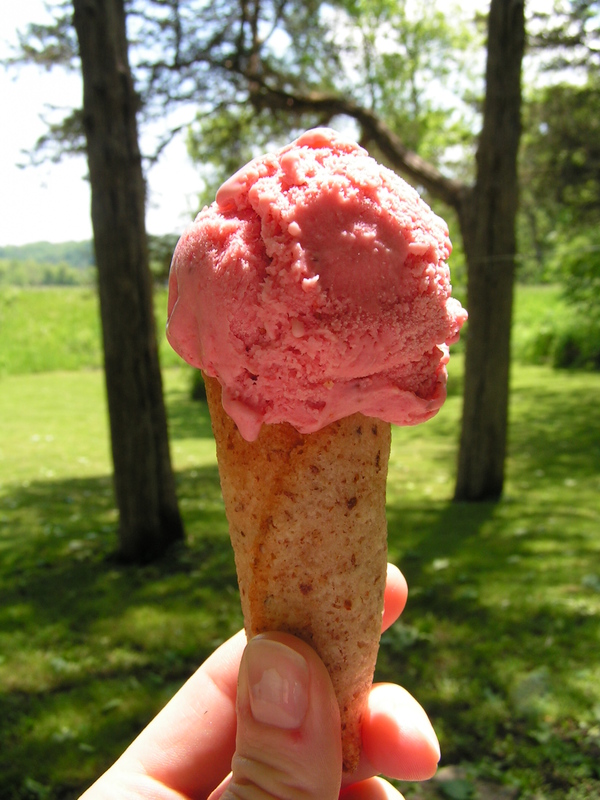 While the ice cream is chilling why not try making your own ice cream cones? *if you compare my adaptation with the link you’ll find I omitted the sprinkling of sliced almonds to make rolling easier. Preheat oven to 325° F. I used my lovely Silpat but if you don’t have that you can either coat a heavy baking sheet well with cooking spray or line with parchment paper (use a new sheet for each batch). In a bowl whisk together ground almonds, flour, sugar, and salt and whisk in whites, butter, and almond extract until combined well. To make perfectly round circles of batter make a template by cutting 3 1/2-inch circles from a thin piece of cardboard. I made a pair using the thin cardboard from a 12 pack of pop. For a visual, check out this blogger’s work. (Don’t use thick corrugated cardboard because you will wind up piling too much batter into each circle, but conversely don’t use too little batter or your cone will be less than sturdy) Using an offset spatula smear a thin layer into the circle using the height of the template to level off the batter. Otherwise you can drop rounded teaspoons batter about 4 inches apart onto baking sheet and with back of a spoon spread into 3 1/2-inch rounds. Bake in middle of oven 8 minutes, or until golden. Watch closely, you want the cookies to be golden with a browning on the edge but don’t overcook! I mean it. Don’t step away, check at 6 minutes and be vigilant. Why? Because when you pull them out of the oven they need to be flexible, almost undercooked and definitely not crispy. Allow them to cool for maybe 30 seconds to firm up and allow you to slide a spatula underneath without tearing and then start rolling into cones. If you have heatproof fingertips you can try to free form the cones but I found that making a cone to then roll the cookie onto worked wonderfully. I used squares of cardboard rolled into a narrow cone and taped into place. I made 6 cardboard cones since I baked the cookies in batches of 6. A few more tips, roll the cookies while they’re still on the baking sheet. The residual heat from the baking sheet will keep them warm and pliable longer than if you moved them to the counter top to shape. Also, place the cardboard cone tip 1/2-inch from the edge of the cookie when rolling to form that narrow tip of a cone (versus a large open hole for the ice cream to drip through). Finally, when rolling the cookie press the seam firmly, allow to cool slightly on the mold, and then remove before the cookie cools, contracting on to the mold.